I need to update the WordPress theme Karen Montgomery and I are using on our Powerful Ingredients 4 Blended Learning site, to make it easier / clearer for visitors to get information about our “Digital Magic Tricks Workshop” for educators and register directly for the June 21-22 workshop we’re planning to offer in Oklahoma City at Metro Tech. These links have been buried on our website and NOT been easy to find. (The registration link has only appeared on the “Calendar” link, which uses GigPress. This isn’t necessarily the most obvious place for it.) At times like these, I wish I had a talented graphic designer in my family! I’m certainly more of a “content person” when it comes to websites, and although I have a few design skills they are not very polished. I’ve been wanting to add a header section to our website homepage, which would include several links to the important topics / pages we most-want visitors to view and visit. One of the best-designed educational services sites I’ve seen in awhile is the homepage for Edublogs.org. I love their simple and colorful graphics, as well as the straightforward way they present their three primary services. I’d like to integrate a WordPress theme which permits / utilizes a similar look and approach. This evening I discovered the Impression Premium WordPress Theme, which sells for $27 from themeforest.net. I’ve never purchased a commercial WordPress theme to date, and I’m not entirely averse to buying one, but if a good theme is available which has the functionality I want I’d likely opt for the free / cheaper version. One advantage of this approach is it can be shared with others and replicated readily, since money is not required! The themes I use on this blog, Learning Signs, Eyes Right, Storychasers, and Powerful Ingredients 4 Blended Learning at this point are all free. If possible, I’d like to maintain this pattern. My question for WordPress users, dabblers and developers is: Do you know of a free WordPress plug-in which provides equivalent or comparable “hyperlinked sliding image banner” functionality to that utilized in the commercial WordPress theme, Impression Premium? It appears it uses a jQuery based plug-in, but I don’t know which one. The website Bon Education currently uses the Impression Premium theme. I peeked at its source code using the Google Chrome “inspect element” feature. I found the free vslider WordPress plugin, which looks similar but isn’t quite the same. 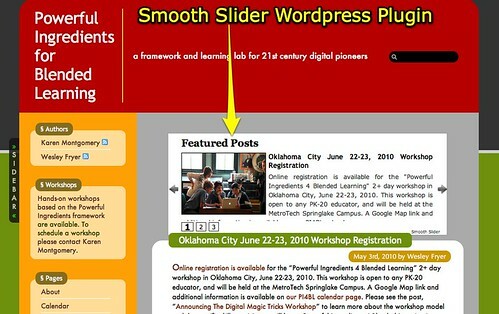 The Smooth Slider WordPress plugin looks like it might work, and it integrates existing posts. This evening I went ahead and installed Smooth Slider on the blog experimentally. Any recommendations or suggestions for alternatives or design tweaks? Coin Slider looks great, Paul! This was just the sort of plugin I was hoping to find with help – thanks so much for your assistance! I’ll give it a try.